Two eclipse chasers at Steampunk Brew Works in Town and Country retrofitted steampunk-style glasses with welder's lenses to view the eclipse. 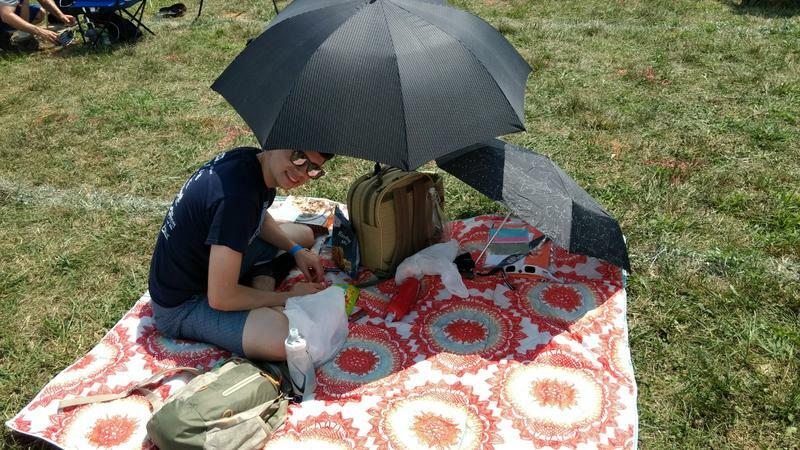 Click through this slideshow to see more listener photos from the eclipse. 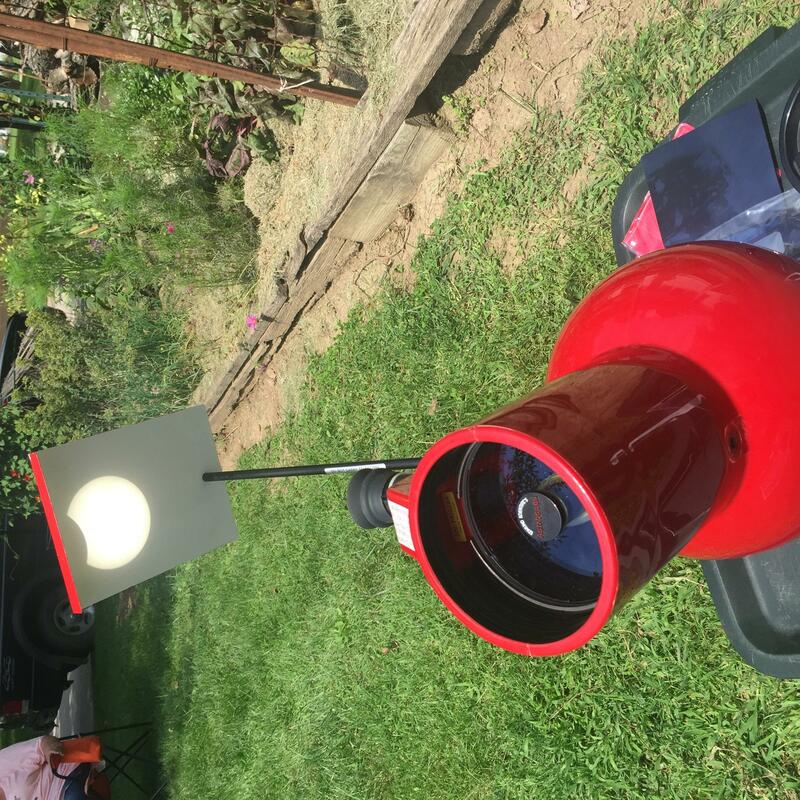 Michael Byrd shared this picture of his telescope from Owensville, MO, taking in the eclipse. 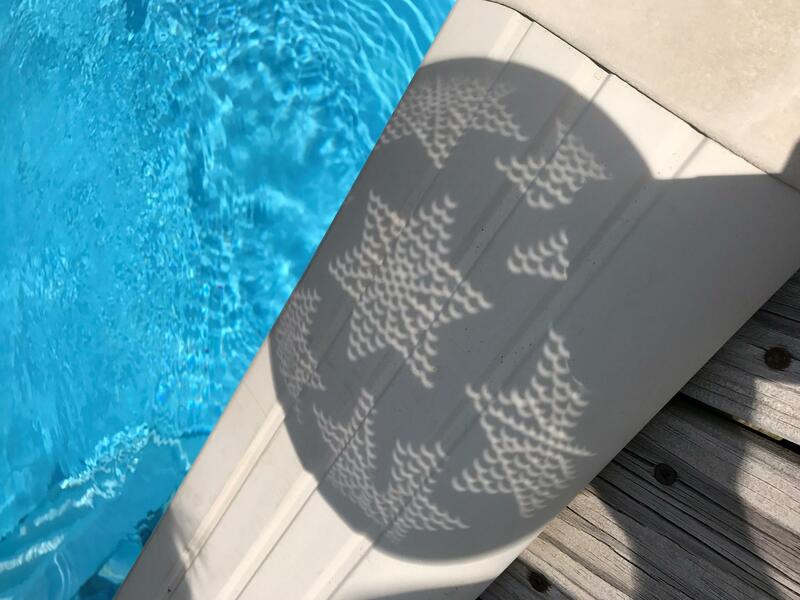 Keith Patten shared this eclipse photo through a collander poolside in Marion, Illinois. 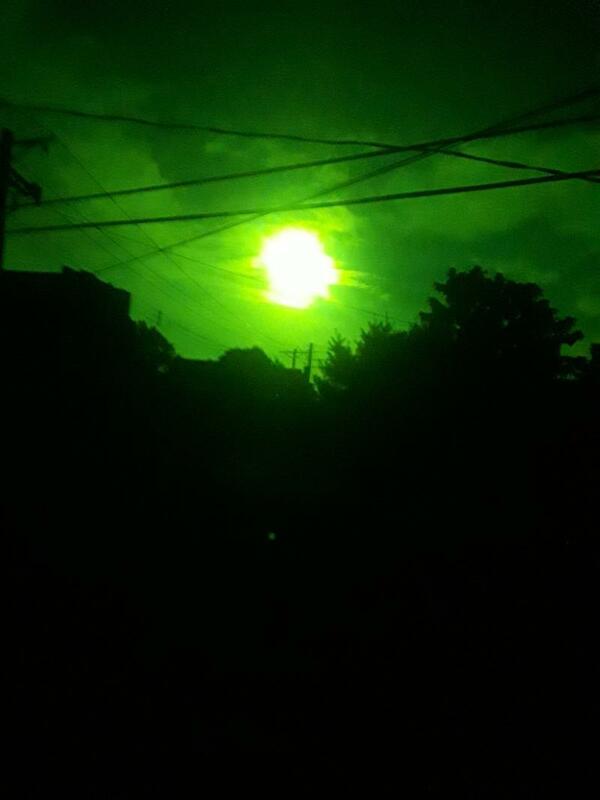 Dave Wise shared this photo of the partial eclipse as seen through welding glasses from Tower Grove Park. 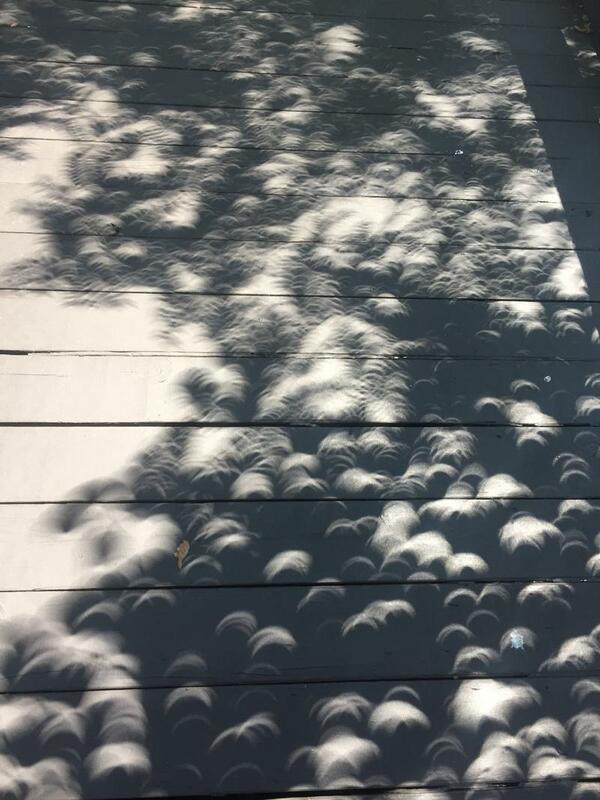 St. Louis on the Air Twitter follower @swkogan shared this photo of the shadows through the trees during the eclipse, writing "Was expecting to watch some cool stuff in the sky. Didn't realize I should also look at the ground. The shadows were surreal." 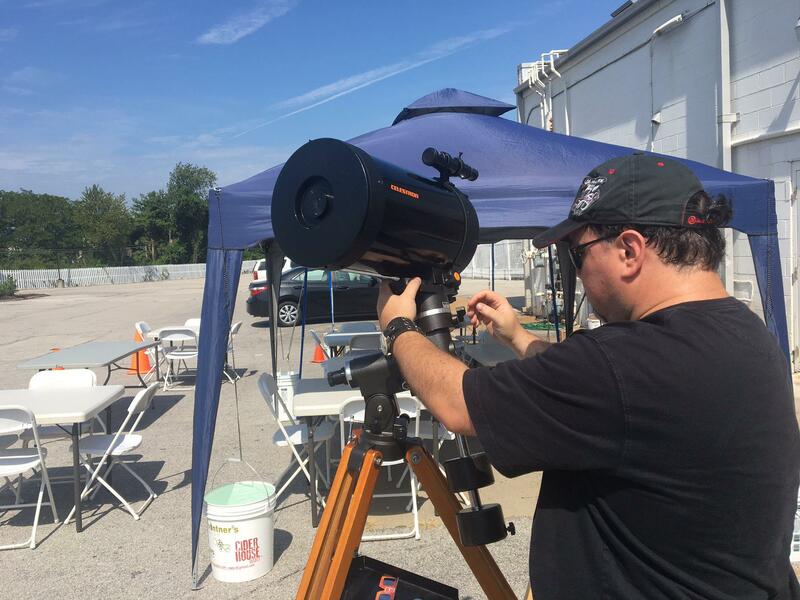 UMSL physics and astronomy professor Dr. David Horne prepares a solar telescope to view the total solar eclipse from Steampunk Brew Works in Town and Country. The Big Brother Big Sisters of Eastern Missouri team at Jefferson Barracks Park. 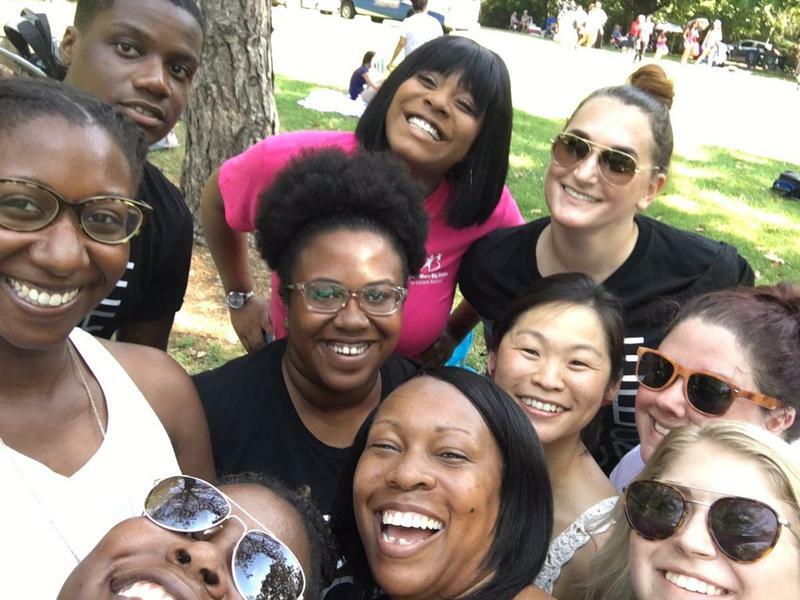 Challenger Learning Center program manager Erin Tyree shared this shot from her picnic in Ste. Genevieve for the total solar eclipse. 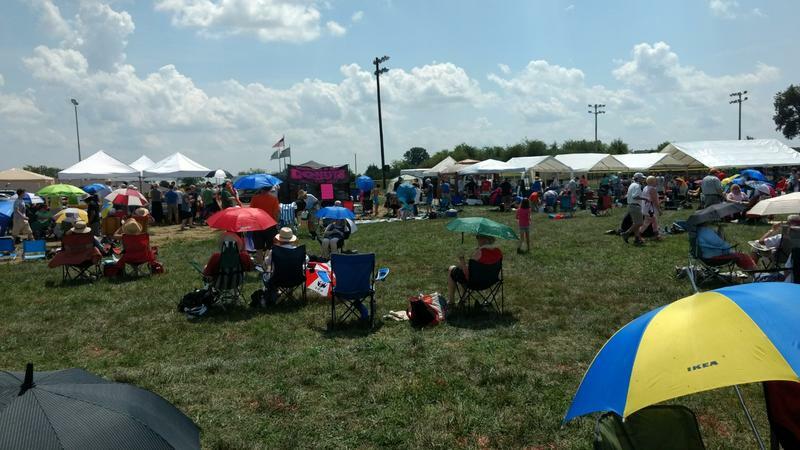 The crowd for total solar eclipse viewing in Ste. Genevieve. 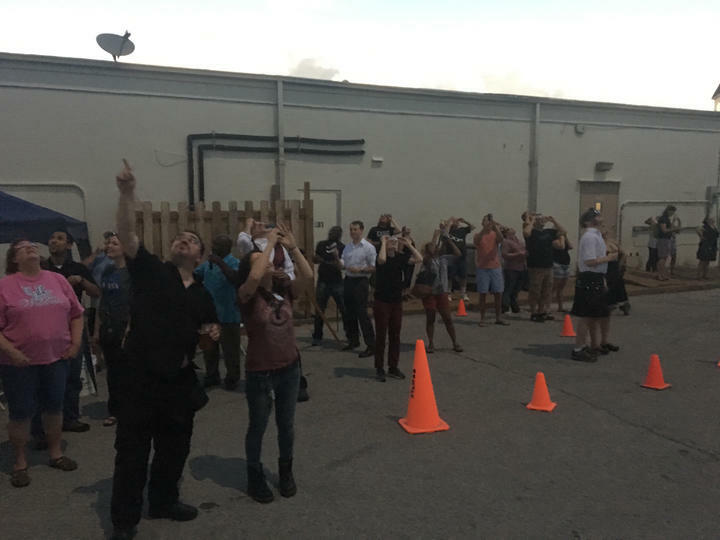 Two eclipse chasers at Steampunk Brew Works view the beginning of the total solar eclipse. 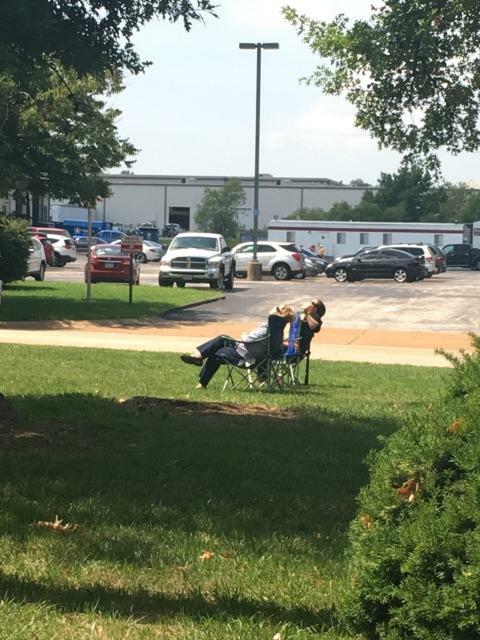 Two employees of FP Web in Fenton, Missouri relax during the work day, taking in the solar eclipse. 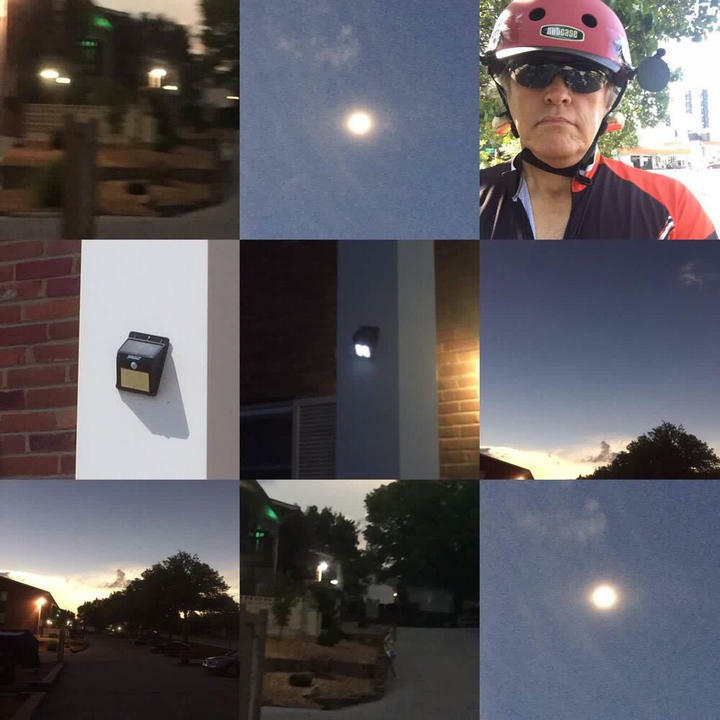 Wes Ridgeway shared this photo collage over Facebook of automated lights turning on during the eclipse. 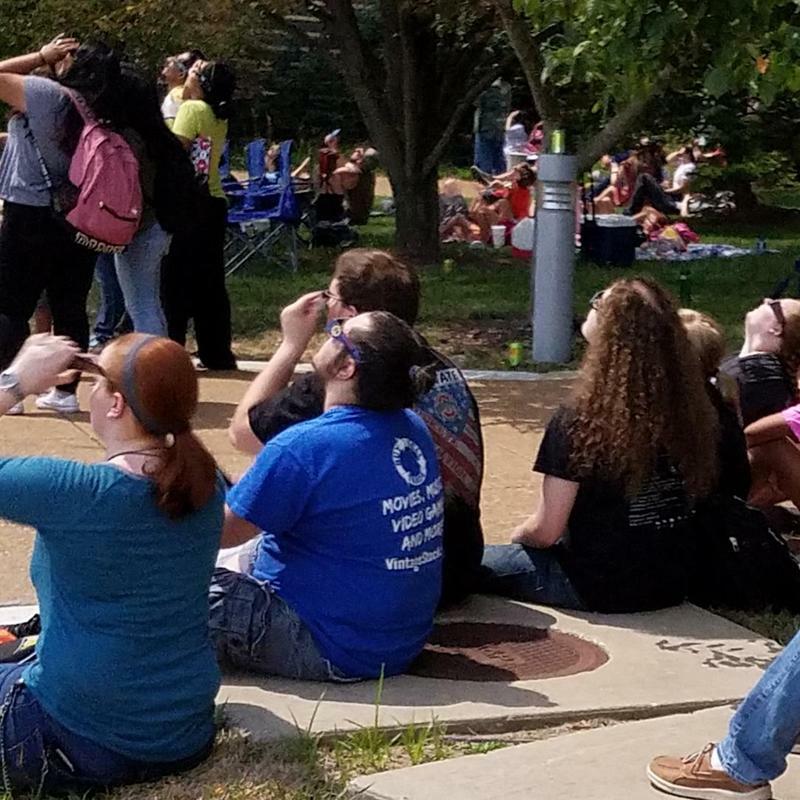 UMSL physicists, astronomers and friends watch as the moon completely overtakes the sun. Morgan Bradley shared this photo of her view of the eclipse. 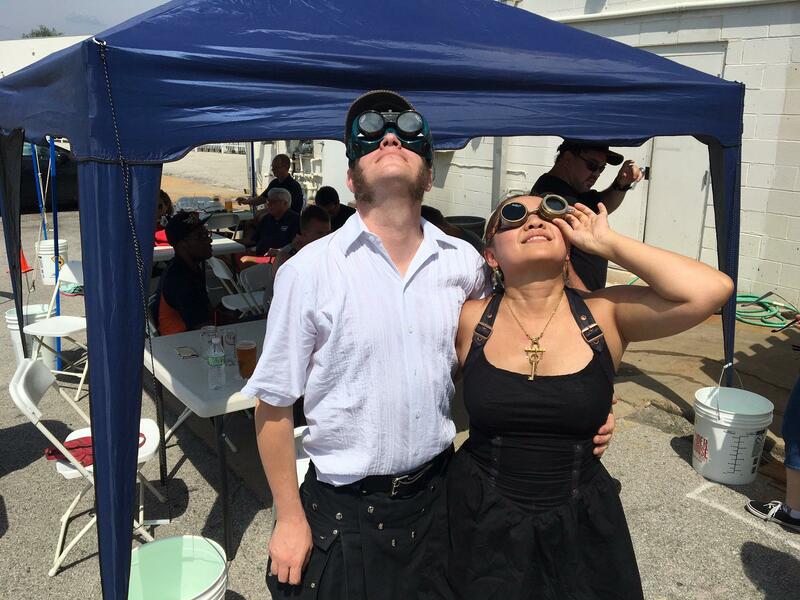 Tricia Grissom shared this photo of eclipse watchers. Listeners and reporters from across the region described what they saw and heard. Scientists and researchers shared what they learned and we heard about eclipses from days of yore. Take a listen to relive the eclipse as-it happened. And scroll through the slideshow above to see what the eclipse looked like from around the region. Total Eclipse of the St. Louis on the Air! For two hours on Monday, we checked in with folks from across the region about what they were seeing, hearing and feeling as a total solar eclipse passed over Missouri and Illinois. 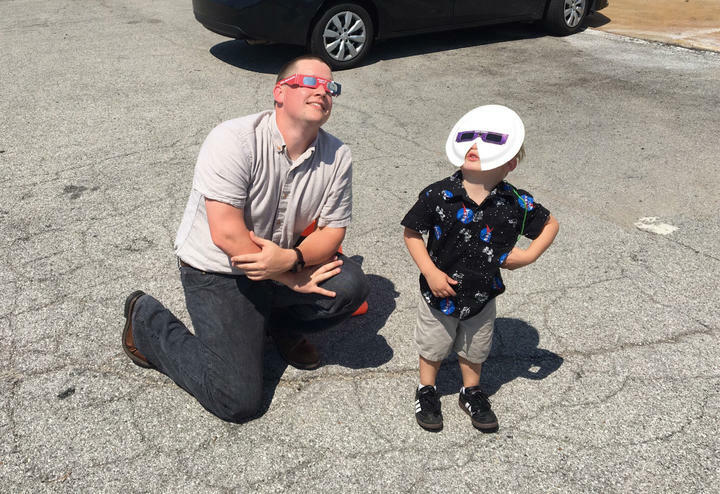 We want to hear from you: What did you see, hear, and learn from the eclipse? Where were you? Leave us a voicemail at 314-329-4937 with your insights, along with your first and last name and where you’re calling from. We may use your response on Tuesday's program. In the meantime, here’s a podcast playlist of St. Louis on the Air coverage of the eclipse up to this point. Rule #1: The only time it is safe to look directly at the sun is when the eclipse has reached totality. You’ll know that by the fact you won’t be able to see ~any light~ through your eclipse glasses at that point. 3. What did solar eclipses mean to people living in ancient times? 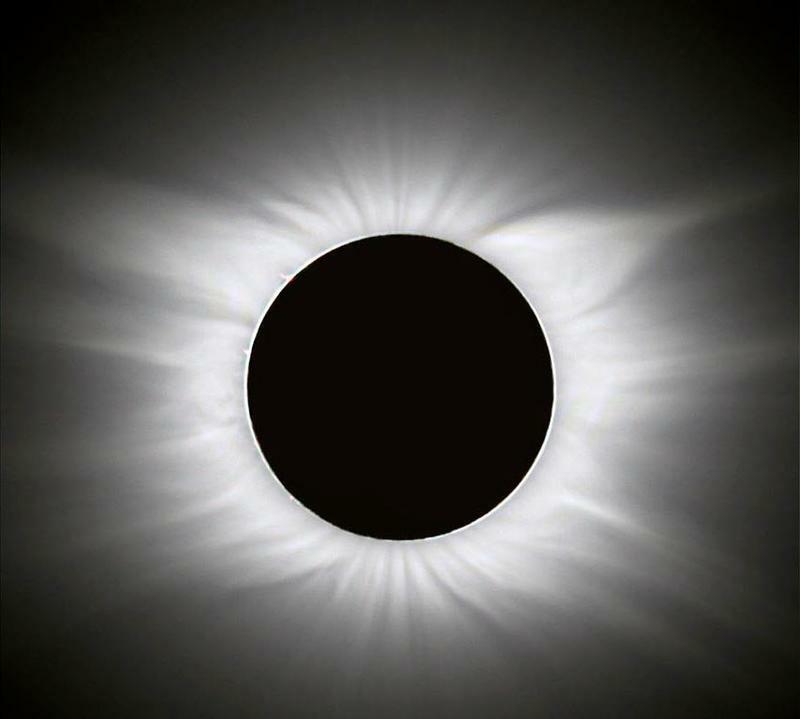 From Babylonians’ scientific tracking of eclipses to frequent myth and lore about the relationship between solar eclipses and animal feeding habits, we discussed how old views of solar eclipses impact our viewing of them today. 4. 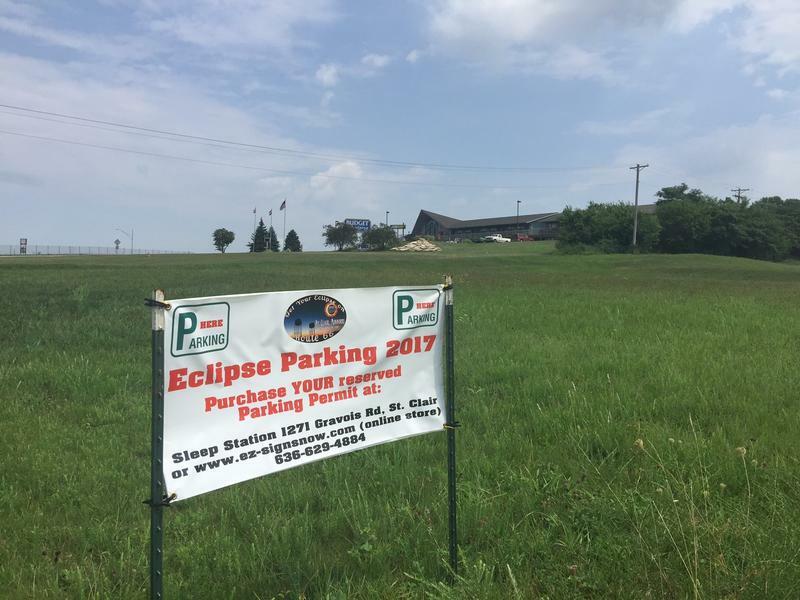 Want to be an amateur astronomer come the solar eclipse on Aug. 21? Here’s how. What should you look for as the eclipse approaches totality? From Baily’s Beads to the solar corona, here’s how you can sound more knowledgeable than your friends. What will Janet Kavandi, a Missouri-born former NASA astronaut and director of the NASA Glenn Research Center in Cleveland, Ohio, be looking for as she observes the eclipse from Jefferson City with a NASA research team? We’ve got your podcast playlist above, but if you need a musical interlude, take a listen to our solar eclipse playlist here. Like any other day, the sun will rise on Monday. But close to noon in Missouri, the moon will start to cover the sun. “You’re going to start to see little bits of the sun start to disappear, like someone slowly taking little bites out of a cookie,” said Anna Green, planetarium manager at the Saint Louis Science Center. The sky will start to go dark quickly, like someone dimming the lights in a room. The air will also become colder, said Angela Speck, astrophysicist at the University of Missouri-Columbia. One of the first science lessons of the year for thousands of students in Illinois and Missouri won’t happen in the classroom, but high above it. 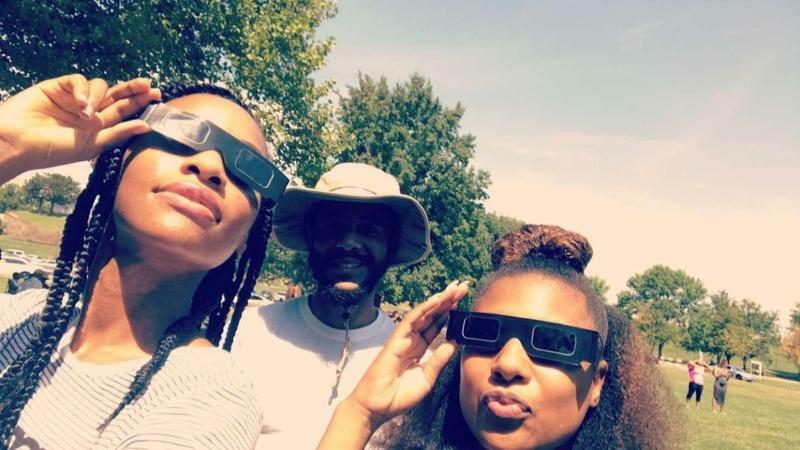 Teachers are using Monday’s solar eclipse as an opportunity to inspire a new generation of stargazers, stockpiling special viewing glasses and planning activities and eclipse-specific lessons. Of course, there’s the other side of the moon: Dozens of schools in the St. Louis area are closing, mostly for safety reasons. Jason Alexander's family has owned the Budget Lodging Hotel in St. Clair, Missouri, for nearly three decades. During that time, only one event has sparked a customer to book a room years in advance.